Trevali Mining is transitioning to an owner-operation at its underground Caribou zinc mine in northeastern New Brunswick, Canada, and is supporting the transition by purchasing a new underground mining fleet. The company has committed to an approximately C$20 million investment through a partnership with Sandvik Mining for supply and maintenance of a full fleet of mining equipment for the mine. Trevali will operate and manage all aspects of the underground mining operation, while Sandvik will be responsible for fleet maintenance. Trevali will rely on Sandvik Mining to maintain underground mining equipment. During 2017, equipment that will be procured and commissioned on-site include two model DD 321 two-boom drill jumbos; five model LH 514 8-yd LHDs; seven model TH 540 40-metric-ton (mt) haul trucks; one model DL 421 long-hole production drill; and one model DS 421 cable bolter/backup long-hole drill. Additional equipment being sourced for the mine includes a grader, a new underground light-vehicle fleet, and a combination of new and used underground ancillary equipment. Iamgold has reported positive results from a preliminary economic assessment (PEA) of its Côté open-pit gold project in the Sudbury district of Ontario, while at the same time reporting that the project has received federal and provincial approvals for the project’s environmental assessments. Seabridge Gold has agreed to purchase a 100% interest in the Snowstorm project from Paulson Gold Holdings LP. The Snowstorm project consists of 31 square miles of land holdings strategically located at the projected intersection of three gold trends in northern Nevada: the Carlin Trend, the Getchell Trend and the Northern Nevada Rift Zone. 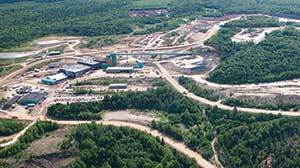 The Fort Hills project was more than 76% complete at the end of the fourth quarter of 2016, Suncor reported, with the remaining work to be based at the site. Activity included completion of the secondary extraction module program. Construction in secondary extraction and utilities has achieved peak activity and continues to focus on productivity and achieving critical milestones. Early-works sustaining activities that will support the execution of the mine and tailings plan following the commencement of production also continued in the fourth quarter. Zinc One Resources Inc. and Forrester Metals Inc. announced they have entered into an agreement where Zinc One will acquire all of the issued and outstanding common shares of Forrester and complete a private placement financing of $10 million. Highland Copper Co. initiated a drilling program at its Copperwood project in the Upper Peninsula of Michigan, U.S. This program is designed to upgrade the current inferred resources at the eastern section of the Copperwood copper-silver deposit, obtain metallurgical samples and carry out further geotechnical studies to refine a mining plan.